Step Two of the Scooter and Riley lesson. After enlarging the drawing, I scrub graphite onto the back of the enlarged image. I like to use a Chunky Graphite Stick, found a cheapjoes.com. It is a nice, soft graphite stick, which is very large, easy to hold, and covers lots of paper quickly. I use a lot of pressure to deposit as much graphite as I can. I like it to be thick and dark. 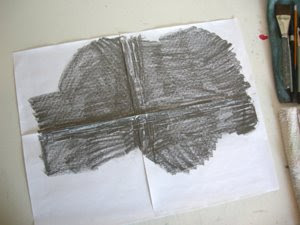 Then I use a tissue or paper towel to gently rub over the graphite to remove crumbs and extra residue. 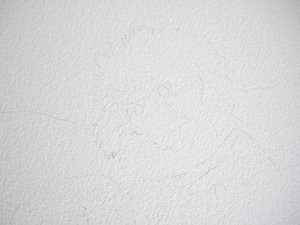 If the graphite is nice and thick, I will not have to use much pressure to trace the image onto my watercolor paper. To apply the drawing to the watercolor paper, I align the drawing where I want it to be, then I tape one edge with masking tape. This helps to secure the drawing yet allows me to lift the paper to see my progress. I use an ink pen to do the tracing. With an ink pen, I can see which areas I have traced, I don't have to press hard which would create dents in my watercolor paper (bad!!!) and it deposits nice, thin lines to work from. Trace only the lines you need to navigate through the painting. If you have created your own drawing, or developed some thumbnail sketches of your subject, the information you need to complete the painting with correct values and shapes should be deeply ingrained in your brain!